I’ve driven just about all the cars they’ve ever made. I remember flying on the Concorde to drive the 1979 Opel Kadett around Paris, back when automakers knew how to treat real journalists. Some cars appeal to the smart version of myself, which I call “Smart” Cracker. Other cars appeal to my lower instincts. That side of myself I call “Dumb” Cracker. I think the 2017 Infiniti QX70S appeals to the “Dumb” Cracker inside of me! The new Infiniti QX70S features Infiniti’s intelligent all-wheel drive with the 325 horsepower 3.7-liter V6 mated to a seven-speed transmission with a manual shift mode. Like bumblebees, respect for elders, the Protestant work ethic, and appreciation for the national anthem, it feels like the “utility” in Sports Utility Vehicle seems to be suddenly disappearing. From the GLE Mercedes Coupe to the BMW X6, who, exactly, are these vehicles for? Hip-hoppers, probably! The new Infiniti QX70S’s all-wheel-drive system will redistribute torque all the way rear or up to 50:50 front and rear. In S trim you get 21-inch Enkei six-spokes. I don’t need wheels that big, any more than I need sriracha in my daily can of Campbell’s Cream of Shrimp Soup or a pilot in the cockpit of my airplane named Sally. That’s change, I guess! I’ll have to admit, though; even though the “Smart” Cracker in me thinks this is a kind of a silly vehicle, it has decent power and a sharp look that appeals to the “Dumb” Cracker in me. People noticed! I was leaving the Golden Corral that’s just, let’s say, on the other side of the tracks when an young urban fellow yelled “Look at that Dumb Cracker trying to drive with the hatch open!” He must read my column! The new Infiniti comes with an Around View® Monitor system, which as a part of the Premium Package and offers a view from four small “superwide-angle cameras” to give a unique “Bird’s Eye View” of the world. 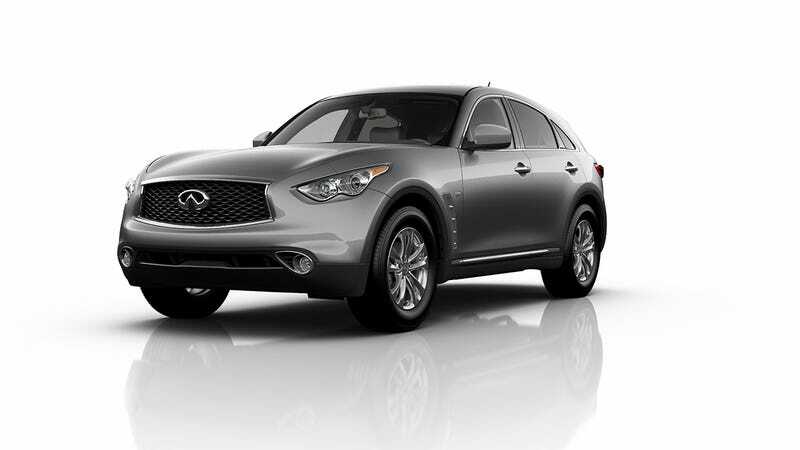 Every new Infiniti QX70S comes with Bose® Premium Audio system, which features 11 speakers. Eleven speakers! That’s a lotta speakers. Normally, I just listen to Sean Hannity on SiriusXM Patriot, but when there’s a really rockin’ sound system I always put in my CD copy of Bill Cosby’s It’s True, It’s True, and boy, it’s like Bill is right there in the Infiniti behind me, telling me jokes over my shoulder, just trying to get me to sit back and enjoy life. It always works! So would I buy an Infiniti QX70S? “Smart” Cracker says no, but “Dumb” Cracker could be persuaded. Thankfully, I don’t have to. They send me cars for free. “Cracker” Jack MacSwagbag has been writing about cars for over 50 years for many esteemed publications, including the Ennis Daily Examiner, Lake Minnetonka Yachtsman, Southwest California Union-Tribune-Tribune-Press, North Detroit Herald, Beirut Patch, Sarajevo Patch, Pyongyang Patch, Fort Bend Statesman, Normal Illinois Stranger, Better Hyrule Gardens, The Cabbot Cove Chronicle, and Motor Trend. What Do You Want To Know About The 2017 Volvo S90?